Kouseis life has been dull and gray. His friends Tsubaki and Watari try their best to cheer him up but theres not more color in his life; His eyes dont sparkle. However, theres this new girl who might just be able to change all that. Kousei, Tsubaki & Watari sit down to watch Kaoris performance which ends up being completely unlike anything else theyve seen. Kaori just seems to have a way with music completely different to how Kousei was taught. Kousei and Kaori spend some time together and get to talking about Kouseis past. Will he ever be able to play a piano again? What happens if he can never overcome his fear, will color ever return to his life? 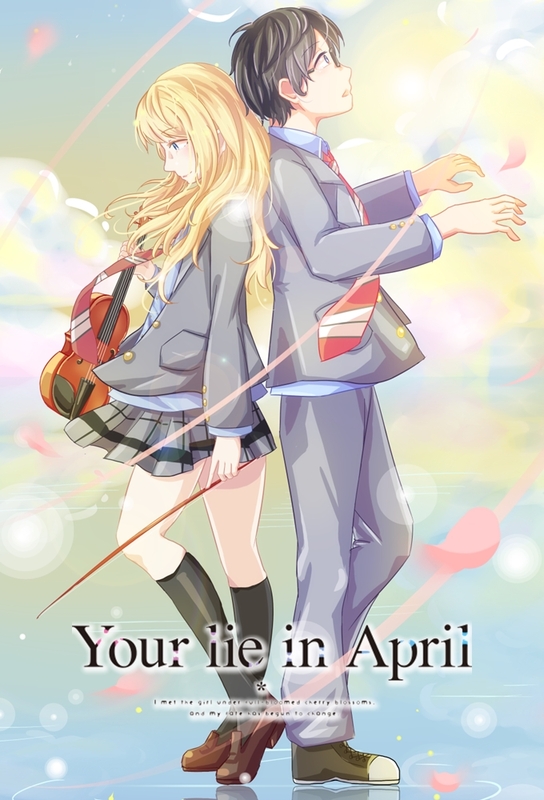 Kaori is recovering from her accident after the performance, and Kousei, Watari, and Tsubaki are starting to realize the new feelings that are brewing in their group. The Maihou Music Competition has started and Kousei is starting to feel his fears catching up with him. At the same time some old rivals have appeared and are set on competing with Kousei. Kousei and Kaori get themselves ready for the Towa musical gala they were invited to. However, when it was their turn to go up and perform, Kaori still hasnt arrived at the musical gala, leaving Kousei to go up by himself. Kousei has taken the stage at the Gala Concert. Endeavoring to put on a performance without Kaori. This is his chance to prove his abilities as a pianist and try to come to terms with the memory of his mother.